Image caption Powys Teaching Health Board said the scheme would deliver "major improvements"
A £7.8m upgrade for a community hospital has been given the go-ahead by Powys planning officers. Bro Ddyfi Community Hospital in Machynlleth will get three new extensions - one of them to replace existing buildings - by 2021. 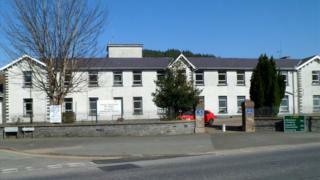 Powys Teaching Health Board said the scheme would deliver "major improvements" to facilities. It is part of a £68m programme to provide 19 new integrated health and care centres around Wales. Health Minister Vaughan Gething announced the nationwide plan in 2017 as part of a drive to bring NHS and community services together under one roof. Michael Williams, Powys county councillor for Machynlleth, told the Local Democracy Reporting Service he was "delighted" the scheme had been given the green light. Planning officers approved the project under delegated powers, so it did not need to go to councillors for a decision.